A few statistics about travel influencer Oneika Raymond: She’s been to 113 countries, has nearly 77,000 Instagram followers, has lived on three continents, and hosts two shows on the Travel Channel. She’s also been blogging for 14 years, starting as a weekend hobby while she was still teaching at international schools. 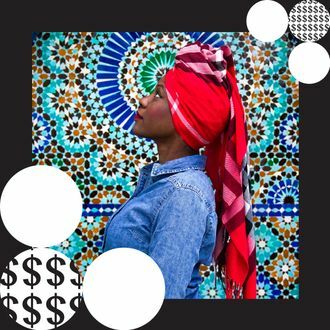 Her blog is “dedicated to inspiring, encouraging, and empowering women and people of color to see the world,” and she seeks to demystify travel for a broader demographic. Here, she talks about quitting her day job and supporting herself as a full-time influencer — on a call from Hong Kong, hours before a flight to Bhutan. I got my first passport when I was 6 months old. I was born and raised in Toronto, and I come from an immigrant family. My parents moved to Canada from Jamaica when they were teenagers. We always traveled a lot because we had family in the Caribbean and the U.S. I was a French major at university, so I had the opportunity to spend a year in France. When I touched down in Europe for the first time I was hooked. All these sensory experiences, the language, the culture, the people — I just loved it. When I graduated, my mom was like, “It’s time to start your real life.” But I hated being home. It just felt so … normal. So I started looking for ways to work abroad. Coming from an immigrant family, the backpacking-and-finding-yourself thing was not an option for me. So I found this little program in France where I could teach English as a second language. It didn’t pay very much, as it was only 12 hours a week, but it was a living wage. While I was there I learned about international schools, where diplomats and other affluent families send their children and where the pay is excellent. So I got my master’s degree in education and for the next ten years, I taught in different international schools in London, Hong Kong, and Mexico. Around 2005, I started a blog called Oneika the Traveller, basically as a way to update friends and family on my whereabouts. I spent nights and weekends working on it. My fellow teachers thought it was strange. Facebook was only just taking off, and the idea of chronicling your life online seemed dorky. So I wasn’t open about it, but around 2008 and 2009 I began to accrue an audience. People were somehow interested in what I had to say, not only as a Western person living abroad, but as a woman, and a black woman. A lot of people were like, “Wow, here’s this black girl living in Asia, traveling to Cambodia,” all these things they couldn’t necessarily conceive of, because travel didn’t feel accessible to them. In 2011, editors started reaching out from Condé Nast Traveler and in-flight magazines, offering writing assignments. It was a good side hustle, but it was also validating, to have these major publications noticing me. The Washington Post did a feature on me, about what was like to be a teacher abroad. I was living in London during the Prince William–Kate Middleton wedding frenzy, and a Canadian TV station found me online and asked me to do a segment about that. With all these things piling up, I wondered if I could leverage the blog and turn it into a full-blown career. The stakes were high, because by then I was in my early 30s and accustomed to a certain lifestyle — I was very comfortable, financially — and I didn’t want to struggle. I decided to give myself one year to try to sustain myself through media and blogging. I quit teaching in 2016 and moved to New York City. My last job, in Hong Kong, had given me a significant financial cushion. When you work in international schools, you can make an astronomical amount of money, six figures or close to it, especially in Hong Kong. I was living very lavishly there. I was eating out seven nights a week, traveling to Bali and Thailand on my breaks, and I was still able to save. When I got to New York, I created a media deck about myself, with all my statistics, my press clippings, and the publications I’d written for. I sent it out to sites like the HuffPost and Buzzfeed, as well as tourism boards, in the hopes they’d let me write for them. I also started a YouTube channel, because I really wanted more on-camera work. Anything that would get my name out there would yield more paid opportunities, I did it. Within a month, CTV in Canada reached out to me and said they’d found my vlogs and they liked my style. They had a national morning show, and would I be interested in becoming their on-air travel expert? I couldn’t believe that this national television station that I watched as a kid in Canada was approaching me. Personalities that I grew up with! Like Ben Mulroney! To be on camera with him, broadcast to millions of people, and be paid for it? It was a massive deal for me, the French teacher with a blog. I started building up my Instagram, too, because that was becoming the hot platform. My visual identity is very bright colors, and I do really long captions. Besides straight facts about a destination, I’ll write about social issues, socio-political issues, like I’ll write about religion in Turkey or xenophobia in France. That seems to resonate with people. From there, brands started to approach me. One of my first big partnerships was with Greyhound bus line. They reached out to me and said, “We love what you’re doing, and we will pay you thousands of dollars to make social media posts and a couple of videos for us.” I would have done it for free, just to get started, but it was a domino effect from there. As soon as that happened, it kind of gave me street cred, like I seemed legitimate to other brands. Within six months of moving to New York, I also got a call from the Travel Channel. They said they’d found me online and asked if I’d be interested in working with them. I was like, “Absolutely!” I did some screen tests, and they liked me and kept me on. It’s a huge platform. Once I started to get a lot of offers, I came up with a minimum number: “I’m not going to get on a plane unless they’re paying me at least four figures.” As any freelancer understands, it’s hard to figure out your rates, and even now it’s still the Wild West. Brands reach out and ask what my rate is, and I’m like, “Well, what do you want? Do you want just an Instagram post? A whole article?” Now, I try to lead the conversation. I will offer packages: For this many thousand dollars, I will offer you two Instagram posts, a blog post, and a mention in Instagram Stories, for example. And also, do you want additional content that you can license for your own usage, your own marketing materials? Because then I have a fee for that as well. Consumer brands like automotive or financial, they are very well-versed in this, because they’ve been working with actual celebrities on endorsements for years. I’ve had potential clients tell me my rate is too high, but you’ll never know how much your work can command until you ask. That said, I never throw out crazy numbers for the sake of it; I think it can come off as unprofessional. Instead, I research how much I realistically think my services are worth to that client. If they’re not able to meet my number, I’ll chat with them to see if we can somehow reduce the deliverables to reflect their budget. If that doesn’t work, I simply walk away from the deal. I never want to feel taken advantage of or poorly compensated for my work. I’m now making six figures. I am extremely grateful for it, but I’ve hustled and worked harder at this job than I ever have before. There’s no closing my computer on a Friday night and opening it up again on Monday morning. It’s not just Instagram; I write for Alamo, the car rental company, on their website, and I write for Marriott. I have so many partnerships you’re not necessarily seeing on my feed. I’m constantly working, constantly creating content, editing photos, answering emails. I travel on behalf of these companies and have some luxurious experiences, but I’m on a gig, not necessarily experiencing the destination. It’d be nice to sit at a table having a cocktail at sunset, but instead I’m dangling from a balcony trying to get photos of that sunset. I love it, but it’s definitely work. I’m well-compensated but I still realize that it can all disappear tomorrow, and I never want to be in a position where I’m not financially stable. I have a 401(k) and save aggressively, and I have investments and savings. That’s key for me. What Does It Really Take to Make Money on YouTube?